Tn the bed race, contestants had to push their teammates down a basketball court, switch robes and places on the bed, and run back to the other end of the basketball court. First place: Regal, second place; Spring Hill; third, St. Martin; and fourth, Lake Henry. First: Rugrats, Brooke, Kayla, and Hannah Olmscheid, St. Martin; Megan, Brad, and Ryan Welle, Jeremy and Jorn Lieser, all of Spring Hill; and Taylor Wessel, Lake Henry. Second: Good Ole Days, Matthew, Nathan, and KateLyn Spanier, Lake Henry, and Diana Bertram, Spring Hill. Tied for third: Color Crayons and Siamese Twins. The Color Crayons, Kim, Emily, and Tyler Magedanz, Vanessa and Chelsea Anderson, and Megan Ludwig. The Siamese Twins, Andrea and Erika Schlangen, Lake Henry. A new event, placing in the lightweight division were Tony Schlangen, Dale Wessel, and Floyd Hess. In the heavyweight division were Billy Wuertz, Greg Marthaler, and Gene Wuertz. The winning Polish drill team were the Higher Goons. Competing are Steve Bast, Tammy Swanson, Marcie Eischens, and Curt Kampsen. 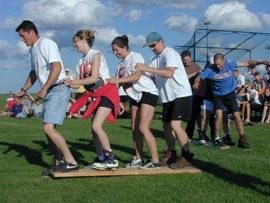 Included in the contests were the costume race, bat spin, Polish drill team, three-legged sack race, obstacle course, speed ball toss, bed race, and free throw shoot. Third place: Kamacaize, Trish Lieser, team captain.